Eager to avoid my customary trap of overly ambitious holiday menu planning, this year I’m all about simple vegan Thanksgiving offerings, including last week’s vegan cornbread stuffing and stuffed delicata squash. Today, I’m turning that same mentality to side dishes and sharing an easy brussels sprout hash with coconut bacon. I’ve often been appointed the person who’s in charge of side dishes for Thanksgiving meals, since so many of them are easily veganized. Being in charge of sides, I’ve learned, is no easy task. They may seem less ambitious than an ornate main dish on first glance, but they can be every bit as time-consuming, especially if you’re tackling a bunch of them for a single meal. This hash is my answer to side dish overreaching. Shredding the sprouts ensures a lightening-fast cooking time, and the seasonings are simple: just onion, salt, pepper, smoked paprika, and a touch of maple syrup and vinegar for sweetness and acidity. The coconut bacon can be prepared well in advance, but even if you decide to cook it along with the sprouts, it needs only 13-15 minutes in the oven, so it’s easy to finish as the sprouts are being prepped and cooked. This dish may not please Thanksgiving traditionalists, who are accustomed to whole roasted or pan glazed sprouts. I love oven-roasted sprouts, too, but I’m really happy to have a new way to prepare one of my favorite crucifers. The coconut bacon adds just the right amount of sweet/salty intensity to the dish. If you’re not a coconut lover, you can definitely use my shiitake bacon or your favorite store-bought vegan bacon instead! This has was made even easier with the use of my GreenLife cookware. The GreenLife brand makes safe, healthy ceramic nonstick cookware that is also budget-friendly and perfect for new and seasoned cooks alike. I love that the pans allow me to saute and simmer without having to worry about ingredients sticking to the bottom of the pan and burning; it means that I can multitask a little as I prepare food, rather than hovering over one dish. If you like, you can add some other vegetables to the hash, like celery, carrot, broccoli stems, or leafy greens. And you can also use leeks in place of the onion, or a combination of leeks and shallots. Like most hash recipes, this one is easygoing. Heat the oil in a large skillet over medium heat. Add the onion. Saute for 4-5 minutes, or until the onion is just clear. Add the brussels sprouts and a generous pinch each of salt and pepper. Continue cooking for 5 minutes, stirring frequently, or until the sprouts are bright green and tender. Whisk together the smoked paprika, vinegar, and maple syrup, then add them to the pan. Continue cooking for another minute or two. Stir in the coconut bacon, then taste the hash and adjust seasonings as needed. Serve. Coconut bacon can be prepared up to two weeks in advanced and stored in an airtight container in a cool, dry place. 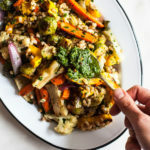 Whether you’re celebrating Thanksgiving this coming week or not, this hash makes for an awesome, all-purpose fall side dish. 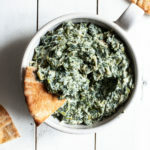 I’ve been serving it with cooked grits or polenta, tossing it into salads (it’s great with greens and roasted sweet potatoes), and serving it as a quick and delicious green offering alongside dinner. It’s so good. This looks so delicious! So simple and tasty, I’m on a huge coconut bacon kick right now, so I can’t wait to try this out! I actually just made a brussel sprout has just the other day with that handy bag of shredded sprouts from trader joe’s, a chopped up sweet potato and sunflower seeds. This version looks fantastic, i have a great spanish pimentón that will be perfect!